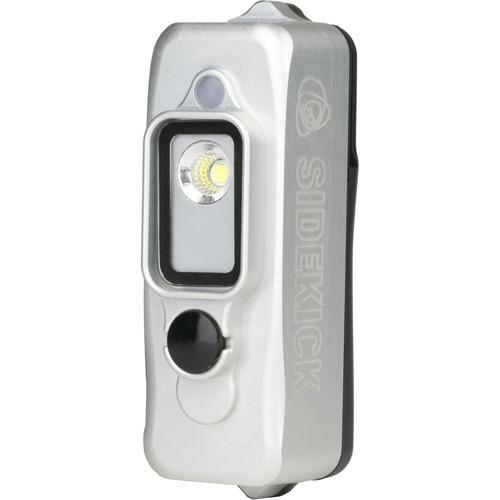 We recommend checking out our discussion threads on the Light & Motion Sidekick Duo LED Light for GoPro 856-0575-A, which address similar problems with connecting and setting up Other Action Cam Accessories Light & Motion. The user manual for the Light & Motion Sidekick Duo LED Light for GoPro 856-0575-A provides necessary instructions for the proper use of the product Camcorders - Action Cam Accessories - Other Action Cam Accessories. The Sidekick uses a simple bolt extender to attach to the opposite side of a GoPro thumbscrew, making the Sidekick compatible with virtually every GoPro mount. Out-of-the-box it mounts vertically on the side of the camera, but it can also be mounted above the camera using the optional Dive Arm Mount Kit. Other optional accessories include a Cold Shoe/Tripod Kit for mounting on a DSLR or tripod, and a GoPro Mount Adapter for direct mounting to a GoPro three-prong mount. Weighing less than the GoPro itself, the Sidekick won't hinder your POV action footage. It is powered using an internal lithium-ion battery that enables continuous run times up to four hours in the Low output setting. The battery is recharged using an included charging cable that slides onto the Sidekick and plugs into any standard USB wall charger. Charging time for a depleted battery is approximately 4.5 hours. A colored LED indicator clearly displays battery levels during use and when charging. If you own a Light & Motion other action cam accessories and have a user manual in electronic form, you can upload it to this website using the link on the right side of the screen. Dimensions 3.2 x 1.2 x 1.5"
Box Dimensions (LxWxH) 6.4 x 1.4 x 1.4"
The user manual for the Light & Motion Sidekick Duo LED Light for GoPro 856-0575-A can be downloaded in .pdf format if it did not come with your new other action cam accessories, although the seller is required to supply one. It is also quite common that customers throw out the user manual with the box, or put the CD away somewhere and then can’t find it. That’s why we and other Light & Motion users keep a unique electronic library for Light & Motion other action cam accessoriess, where you can use our link to download the user manual for the Light & Motion Sidekick Duo LED Light for GoPro 856-0575-A. 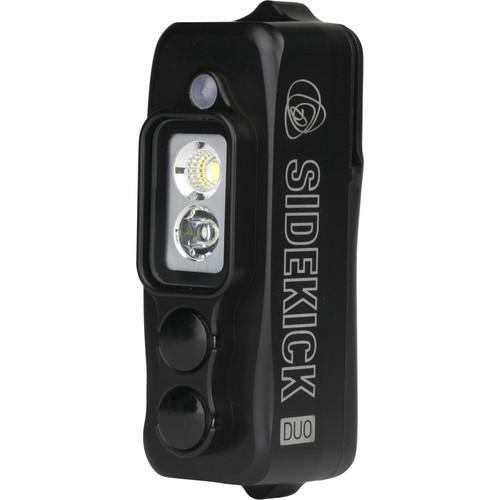 The user manual lists all of the functions of the Light & Motion Sidekick Duo LED Light for GoPro 856-0575-A, all the basic and advanced features and tells you how to use the other action cam accessories. The manual also provides troubleshooting for common problems. Even greater detail is provided by the service manual, which is not typically shipped with the product, but which can often be downloaded from Light & Motion service. If you want to help expand our database, you can upload a link to this website to download a user manual or service manual, ideally in .pdf format. These pages are created by you – users of the Light & Motion Sidekick Duo LED Light for GoPro 856-0575-A. User manuals are also available on the Light & Motion website under Camcorders - Action Cam Accessories - Other Action Cam Accessories. Just received my sidekick duo - charged fine - lights work but something inside is loose as it bumps around inside when I move or turn the light. Is this normal? I dive in 2 weeks and want to resolve this before I’m disappointed.